On August 28th a train the trainer program on PR ERF curricula and methodological tools was offered to a group of 17 teachers at Scalda College in Goes. The program was offered in combination with an introduction program on educational courses requirements at Scalda College, and the challenges the new exam regulations are posing to the different IVET programs and to the teachers. Participants discussed students’ main areas of development. In general teacher agreed that in most courses students still lack the capacity and experiences in reflection and in making choices. Arrangements were made to pilot the PR ERF materials for this particular learning objective. Materials will be selected from KC Learning to Learn and KC entrepreneurship. On September 15th Martin van der Plas, Scalda College at Goes, has arranged for the kick off on PR ERF. The pilot consist of a cycle of 6 lessons in which 3rd year Doctor’s Assistant students will gain more experience in reflection, receiving feedback, giving feedback and in making (career) choices. All lessons will make use of practical situations which these students can encounter during their work placement period. The “PRERF” pilot sessions took place in Uppsala. The tested Key Competences were Learning-to-learn, Communication in foreign languages, and Mathematical literacy. 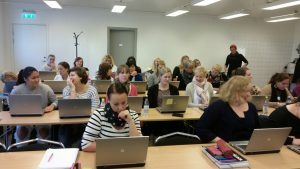 The trainers acknowledged the effectiveness of the platform, while the students were curious about the tool and enjoyed the process of learning. The feedback received from the both sides was incontestably positive, which signifies that the developed methodology and platform proved to be viable. 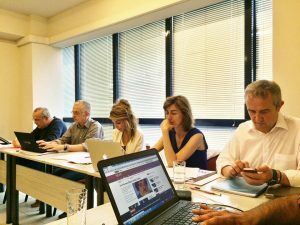 The Greek city of Thessaloniki held the fourth meeting of the European project PR-ERF on May the 4th and 5th. The purpose of the meeting was to monitor the implementation and progress of the project and present the pedagogical materials prepared for the delivery of the training program in key competences of the European Framework (ERF) for personal assistant in the health care sector, which is the overall project objective. During the first day the partners presented the developed curricula and methodological tools for all Key Competences and then decided upon the plan for the pilot activities. Major part of the second day consisted of a training in the e-Learning platform, as well as discussion of financial, dissemination, and quality issues.